Tokai Forum - a subsidiary of TokaiRegistry.com :: View topic - Pre "by Gibson" Orville serial number help? Pre "by Gibson" Orville serial number help? 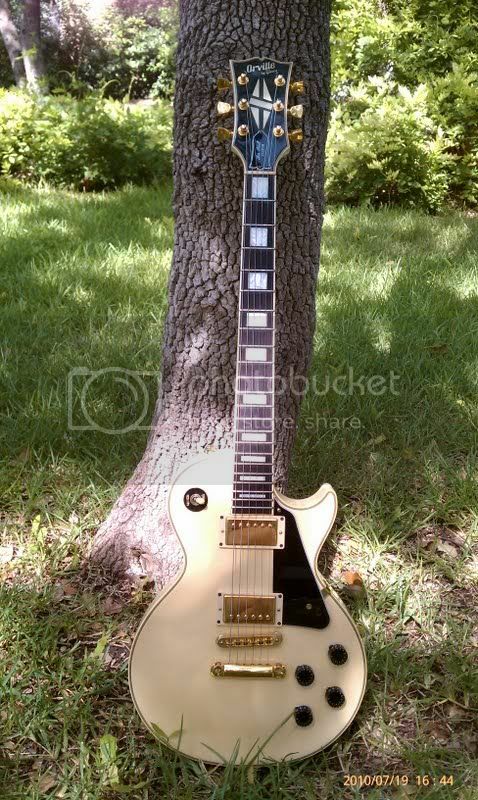 Posted: Mon Aug 30, 2010 9:45 am Post subject: Pre "by Gibson" Orville serial number help? Hi everybody, I'm new here and this is my first post. My name is George and I'm 16. I'm from the States. I have a lead on an Orville, not "by Gibson" Goldtop Les Paul believed to be either a 86 or 87. The serial number is 6 digits with no letter. Is this a valid serial number? If so, how do I date it? It ends with 85 but starts with 5. Would this make it an 85'? Any help appreciated thanks. Also, any other info on pre-ObG Orvilles would be helpful too. Thanks. The Orville by Gibsons started in 1988 and went to 1995. The Orvilles started in 1989 and went to 1998. So there was no Orville before 1988? Ok, I got it figured out thanks. The guitar in question is a 1995 Orville Gold top. Some dings and scratches. How much do these usually go for in USD? I don't know if a gold top commands anything extra or not but it is a good time to buy. I just bought this 89 ObG Custom for $750.00. It was already in the states and that price included shipping and a brown Gibson USA hardcase. In general, great shape with a ding or two here and there, to be expected for a guitar that is 21+ years old. Prices are dropping on Japanese axes. They were overpriced over the last 2 years and now people realised that it is easier to add 100? and buy a Gibson. Which I agree with. To pay thousands of ? for a veneer top is in my opinion a bad deal. Maple top.... that is a good question, I am not sure to be honest. All I know is that is the best guitar I have ever owned.